Protecting your business property from damage can be a full-time operation. Why not let a professional cleaning team take the stress out of your day? Our service for commercial gutter cleaning in London, for example, is ideal for keeping your property safe from flooding and water damage. We provide highly effective service using cutting edge, modern technology, and offer appointment times ranging from early morning to late evening throughout the week and at the weekend. This means that there needs to be no interruption to your daily schedule, and your business can go on operating as normal, safe in the knowledge leaking or overflowing gutters aren't going to start massively inflating those overheads. We're expert gutter cleaners, so we use the best equipment on the market. 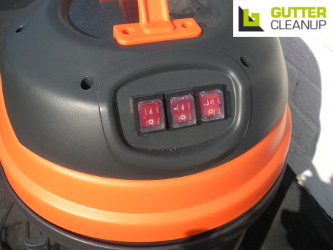 For us, this is the Gutter Vac clearance system, a piece of equipment specially designed for the task at hand. Using this tool means the team can work from the safety of ground level and you won't have to be concerned about having people climbing around near your roof. The system is a powerful vacuum suction device that's far more effective at removing blockages and growth from guttering than any manual clearance method. The cleaners monitor their progress through the equipment's mounted cameras - you'll be able to see just how effective the treatment has been for yourself. We select all commercial gutter cleaners from amongst the top professionals in the local area and give them additional and ongoing training in the latest clearance techniques. This ensures you're always drain pipe the very best clean for your gutters, and the team remains fast and effective at their work. We've been successfully operating in the London area for more than ten years, so you'll easily be able to find feedback about just how good our services are. You can check our testimonial page to make sure we leave our customers happy. Simply call us today if you're interested in learning more about the quality we'll reward you with. We know you're busy, which is why you can make your booking with us at any time, 24/7. Whenever you can take a few minutes out of your schedule simply pick up the phone and dial 020 3404 9878. Speak to one of our advisers about the commercial gutter up you need. We'll be able to give you a cost and obligation-free quote on your requirements right away, and set up your appointment for whatever time's best for you, and most convenient for your opening hours. Alternatively, feel free to fill in our online form or use our chat feature in order to reach us. Both are staffed live around the clock.